At the end of the month, I get creative. Stretching the last few dollars and the remaining food in my house becomes a challenge. It’s usually in these circumstances that I forego the cookbooks and try to put together food that will last a couple of days. For reasons I can no longer remember, I have a savoy cabbage, a couple of tomatoes, and a few dark Japanese eggplants in my refrigerator. There are plenty of stewed tomatoes that I made from the summer’s abundance in my freezer. Do I prepare and eat them separately or do I try to find a way to put them together? I’ve placed this recipe in the Food Alone category for the simple reason that I made it for myself and I expect to get about three meals out of it. What’s more, stuffed cabbage strikes me as a fall and winter dish and even though it’s still in the low 80s/high 70s outside, I like to eat in anticipation of the weather. I look forward to hibernating. First, chop up the eggplant, tomato, and mint. Set aside. While a pot of water was coming to a boil, I carefully separated the leafs of the savoy cabbage. I blanched them, two at a time, in the boiling water for 2 minutes and then drained them. Then I put them in a bowl to the side. I liked using Savoy. The leaves retained their bowl-like shape, which made it easier to fill and then close them up with toothpicks. I started the rice in my rice cooker while I prepared the rest of the filling. I warmed the olive oil in a skillet and added the garlic. One common direction in recipes that begin with sauteing garlic is to put the heat on medium or high. I don’t know why. Garlic burns easily. I start off with a low flame under garlic and raise it as I add other ingredients that will help protect the garlic from browning too much and becoming bitter. After about a minute, add the finely diced eggplant. Because the pieces are so small, they’ll cook quickly and their size will make it suitable for the filling. Add the chopped tomato and cook for a few minutes. Add the mint, raisins, and kosher salt to taste. As usual, I find it can stand a liberal dose of kosher salt. Add to the vegetables in the skillet as much of the cooked rice as you think is necessary for the filling. I didn’t use the whole amount, but about 1/2 to 2/3s of what I prepared. Push all the filling to one side of the skillet, so that you can place the stuff cabbage packets back into the skillet as you prepare them. Filling the cabbage leaves demands restraint. Spoon less than you’re inclined to put in. It will make it easier to fold the stiff spine of the leaf and the sides together into the shape of a packet. Seal with a toothpick. Place the packet back into the skillet. 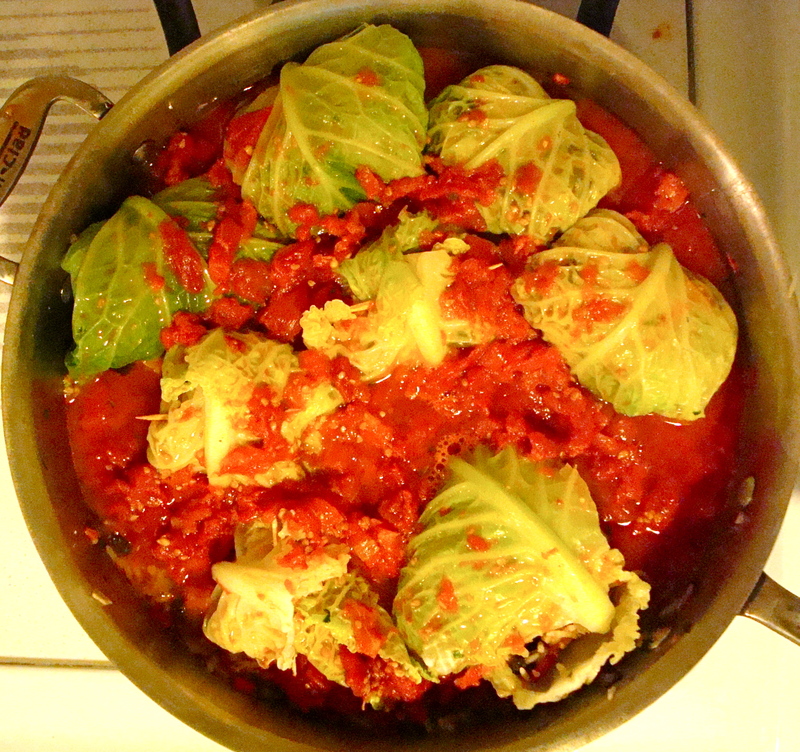 When you’ve filled all the cabbage leaves and placed them back in the skillet, pour the stewed tomatoes over the packets and turn the heat to medium. When the tomatoes come to a simmer, turn the flame down. I let them simmer in the tomatoes and their juices for about half an hour. By the time I removed them from the heat, the tomatoes had reduced a bit. I strew choppped parsley leaves over the cabbage and transferred a few to my plate. I have no idea whether Sicilians consider stuffed cabbage a part of their heritage, but the flavors I chose certainly reminded me of those that I tasted in Sicily. It’s a peasant-ish dish, after all. The vivid red of the tomatoes contributed to the pleasure of eating the cabbage. This was easy enough to make that I’d like to play around with other fillings. Next time, perhaps I’ll use ground pork. But on the whole a very forgiving recipe. And I definitely will have two more meals with the leftovers.